ISRAEL, THE JEWS ... AND YOU. At last a book about Israel and the Jews suitable for the wider Christian market, that manages to be both thorough and entertaining. It is difficult to avoid using superlatives in reviewing this book. First, at the simplistic level, it is great value for money! This is two books in one, delivered across three ‘Acts’ - or three biblical vantage points - from which the troubled history of the Jewish nation can be viewed. Two for the price of one is not just a throw away comment; “Outcast Nation” is a reworking and up-dating of two of Maltz’s earlier books - “The Land of Many Names” and “The People of Many Names” - both now out of print. “Outcast Nation” is a worthy successor and in many respects improves on the earlier material. Act 1 follows the story of God’s covenant people from Abraham to the First exile. Act 2 looks at the history of the Hebrew people from a spiritual vantage point, looking at what has become the world’s longest hatred – the hatred of mankind towards God’s chosen people. Act 3 looks at the modern history of Israel (again from a biblical/spiritual vantage point) and concludes with some very direct questions addressed to individual Christians – just where do we stand before our God as regards to Israel? 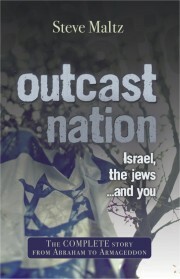 In “Outcast Nation” Maltz introduces us to two Christians; Mr Roots and Mr Shoots. Roots sees the Jewish nation as still highly relevant, indeed central, in God’s ongoing purposes. Mr Roots recognizes the rootedness of the New Covenant in the Abrahamic Covenant. Mr Shoots believes that the root is no longer relevant – indeed it is a distraction. It is the shoots that have grown out of the root that are all-important, and the shoots have indeed taken on a life of their own – now completely divorced from the root. Romans 9 thru 11 are a bit of a problem for Mr Shoots! Most Christians tend to identify (strongly) either with Mr Roots or Mr Shoots - we fall easily into “camps” on this subject. Indeed although Maltz does not specifically make the point in his book, the Church now has a bipolar disorder as regards Israel. We are a decidedly split personality! One pole is the clear attachment to and high value placed on, the root; the other pole is denial of the root. Whilst there are fewer outright anti-Semites in today’s established churches, old habits die hard. Maltz examines the phenomenon of Christian opposition to the Jewish people down through history. It is a sad and salutary tale and, this reviewer would suggest, a tale upon which every Christian should reflect. (This reviewer recently met a Christian who had been to Israel under the auspices of one of the episcopalean churches and was amazed at her open and angry condemnation of the modern Israelis. (“These people call themselves the chosen people ……”) This was in a small shop and in direct earshot of non-Christians. I could not help but feel that what she said about the Jews she would not have dreamed of saying about any other faith system or people group! But somehow even today, the Jews are ‘fair game’ for at least some Christians). Replacement Theology is the accepted term that describes Mr Shoots’ position. Mr Shoots believes that the Church has replaced the Jews in God’s affections. Olive Tree Theology (and more recently Enlargement Theology) are two recognized terms that describe Mr Roots’ understanding. The picture being that the church is rooted in the Hebrew olive tree – which has always been a symbol of Israel. If “Outcast Nation” is beginning to sound like a heavy-duty theological treatise, nothing could be further from the truth! Whilst the subject it tackles is indeed a weighty one, perhaps the most urgent issue facing the modern church, Maltz has an engaging, easy and conversational writing style, coupled with a sense of humour that permeates the book. This is a much easier read than its 383 pages might suggest. So wide ranging is the book that it is difficult to pick out a single thread as being representative of the whole. A key strength is Maltz’s ability to identify and link the most pertinent passages from the Old and New Testaments. This is no “clever” sprinkling of supportive verses to reinforce his viewpoint. Maltz has the knack of pulling in portions of scripture and highlighting how they reveal God’s heart. He encourages his readers to go back to a biblical passage and read-around it, to satisfy themselves that he is correctly handling the texts. A useful feature of the book is Malt’s insertion of extended portions of scripture – this saves readers from constantly dropping the book in order to pick up the Bible, something that can cause us to lose the thread if the references are numerous, or we are reading on-the-move without a Bible to hand! Finally, Maltz encourages all Christians to develop a thoroughly biblical understanding of these issues. He encourages all the Mr (and Mrs) Roots to keep a Godly perspective and not to see everything that the modern State of Israel does and stands for as being by divine right. By the same token he reminds us of the blizzard of negative propaganda about Israel, which requires Christians to be careful about the news sources that they choose to follow. Maltz cautions Mr Roots of a potentially false motive in his love of and appreciation of the Hebrew root, in extremis of trying to become as Jewish as the Jews! Mr Shoots is encouraged to reconnect with his own root, the root that his Jewish Saviour never rejected, and to see God’s covenantal purposes within the whole sweep of biblical history. For crystal clarity Maltz emphasizes the need of Jewish people to come to personal saving faith in their Jewish Messiah – in just the same way as must Gentiles. Maltz emphatically upholds that Jesus is the way, the truth and the life. Highly recommended – 5* "Reviewer – Peter Sammons, author The Birth of Christ (Glory to Glory Publications) and The Empty Promise of Godism (Glory to Glory Publications).